Many households have two or even three cars. An average size garage usually has space for only one car to be protected. What happens to mum’s, your daughter’s or your son’s car? They are left outside, open to all the elements. Description: Made-to-measure Concept Cantilever Carport-Canopy Concept Canopy is designed on a modular basis which means that you can increase the area of the cover at any time and there are no support- pillars needed, giving maximum protection for all the vehicles you are ever like.. Description: Made-to-measure Concept Cantilever Carport-Canopy Concept Canopy is designed on a modular basis which means that you can increase the area of the cover at any time and there are no support- pillars needed, giving maximum protection for all the vehicles you are ever likely to ow.. Description: 2440mm x 3275mm Fascia And Gutter Pack for use with 3 Beam Cantilever Carport Gutter designed to run across the front of the roof along one side ending with a stop end outlet against the wall. Available in Square or ½ Round profile Gutter, with a colour choice of White.. Description: 2440mm x 4875mm Fascia And Gutter Pack for use with 4 Beam Cantilever Carport Gutter designed to run across the front of the roof along one side ending with a stop end outlet against the wall Available in Square or ½ Round profile Gutter, with a colour choice of White, .. Description: 2440mm x 6475mm Fascia And Gutter Pack for use with 5 Beam Cantilever Carport Gutter designed to run across the front of the roof along one side ending with a stop end outlet against the wall. Available in Square or ½ Round profile Gutter, with a colour choice of White,.. Description: 2440mm x 8075mm Fascia And Gutter Pack for use with 6 Beam Cantilever Carport. Gutter designed to run across the front of the roof along one side ending with a stop end outlet against the wall. Available in Square or ½ Round profile Gutter, with a colour choice of White, Bla.. Description: 2440mm x 9675mm Fascia And Gutter Pack for use with 7 Beam Cantilever Carport Gutter designed to run across the front of the roof along one side ending with a stop end outlet against the wall. Available in Square or ½ Round profile Gutter, with a colour choice of White, Blac.. Description: 2440mm x 11275mm Fascia And Gutter Pack Gutter designed to run across the front of the roof along one side ending with a stop end outlet against the wall Available in Square or ½ Round profile Gutter, with a colour choice of White, Black or Brown. Gutter & .. Description: 2440mm x 12875mm Fascia And Gutter Pack for use with 9 Beam Cantilever Carport Gutter designed to run across the front of the roof along one side ending with a stop end outlet against the wall. Available in Square or ½ Round profile Gutter, with a colour choice of .. Description: Bungalow Brackets. Required on canopies with less than 500mm clear brick work above the canopy. 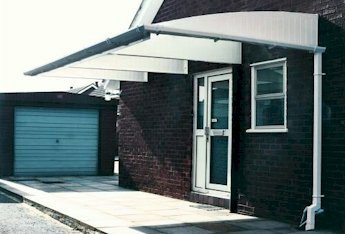 Each beam of the cantilever carport requires a Bungalow Bracket, please ensure you order the correct number required for the canopy you have ordered. The brackets project 600mm out f..